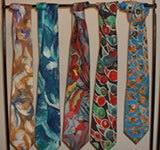 All ties and stoles are painted by hand. Voile scarves are hand-washable and the inks are indelible. Special custom orders can be made from your design on any of the above silks.